Pierre Anctil is a professor in the Department of History at the University of Ottawa. The first Jewish settlers to arrive in what is present-day Quebec probably crossed the Atlantic in the early 17th century. We are not entirely sure, however, because an atmosphere of distrust toward them prevented them from leaving a physical trail of their crossing. We do know that a young woman disguised as a boy arrived in Quebec in the summer of 1738; her name was Esther Brandeau and she claimed to have Jewish roots. She most likely came from the Bordeaux region in France. Since the authorities were not happy about this, the crown paid for her to be sent back to France a year after she arrived. Greater tolerance came with the British Conquest in 1777. This led to the construction of the first synagogue in Montreal – Shearith Israel, or “Remnants of Israel” – at the current corner of Saint-Laurent Boulevard and Notre-Dame Street. There were not many Jews in Canada at this point in history. Most Jews were merchants who worked in cities and rural areas, often importing foreign products or buying local produce to sell. However, one name in particular stands out, a man who went by the name of Aaron Hart. 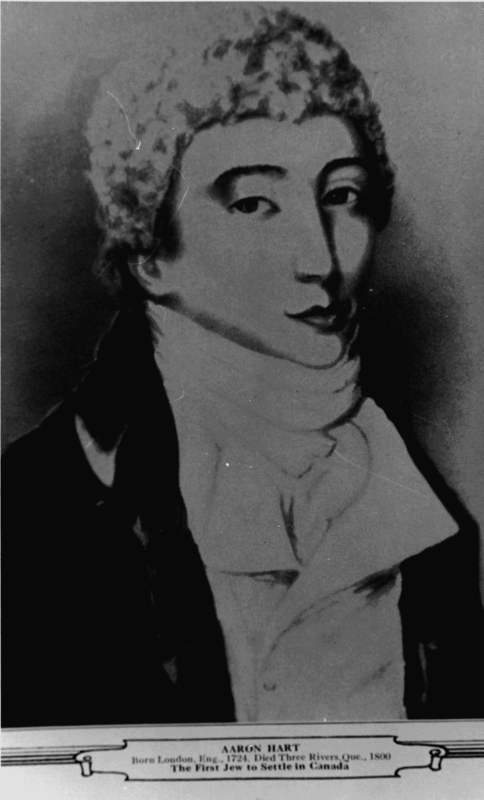 Mr. Hart took up residence in Trois-Rivières around 1761, becoming one of the first European Jews to lay his roots in Quebec. He raised all of his children in Trois-Rivières. One of them, Ezekiel, was even elected to the Legislative Assembly of Lower Canada twice, first in 1807 and then again in 1809. However, he was not able to serve on the Assembly due to his heritage. As a result, he had to settle for working in business. This transgression against Ezekiel Hart was rectified in 1832 when elected officials, including the Speaker of the House Louis-Joseph Papineau, enacted a law giving Jews all their civil and political rights. This legislation was a decisive step forward for Quebec Jews, as it allowed them to participate politically and economically as equals in their host society for the first time. During this period, the Jewish population of Lower Canada was only 107 people, 85 of them residing in Montreal. It was not until the 19th century that the Jewish population saw modest growth. The 150 years between the British Conquest and the turn of the 20th century was a relatively uneventful period in Quebec’s Jewish history, as the population was growing slowly and blending in well with the majority. During this period, most Jews suffered few blatant aggressions, and identified with the English-speaking business class, with whom they shared common interests. For almost a century, only a small number of Jewish migrants arrived on Montreal’s shores from Europe. In 1851, there were barely 200 Jews in the city, and no more than 450 across Canada. This did not prevent some from achieving financial and commercial success during a time when Montreal had just become Canada’s economic capital. The growth in transport and in the timber and natural resources industries, and the dawn of industrialization along the Lachine Canal, offered opportunities for advancement that benefited some Jews, particularly those of British origin. About midway through the 19th century, there was a marked change in pace of the development of Montreal Judaism. This paradigm shift first occurred because of the rapidly increasing numbers of immigrants from Central and Eastern Europe. In the span of 20 years, from 1851 to 1871, Montreal’s Jewish population doubled, reaching 400. It doubled again only 10 years later. By 1891, it had reached 2,500. Then, in 1901, it climbed to 7,000. This sharp increase in Jewish immigration caused a stir in the local British and Sephardic Jewish communities. This was due to the fact that these immigrants were materially and socially ill-equipped for their new environment. They also came from regions with heavy political discrimination where Jews had long been economically marginalized. By the beginning of the 20th century, the number of immigrants from Eastern Europe had reached such heights that, within a few years, this demographic completely dominated Montreal Judaism. Each year, starting in 1904, around 10,000 Jews from Russia, Poland and Romania were welcomed to Canada. Half of them took up residence near downtown Montreal. The rate of growth was so staggering that in 1931 the Jewish population reached 60,000 in Montreal and 150,000 across Canada. This was the highest growth rate for Jews in all of Canadian history. However, immigration slowed in the 1930s, a period that was marked by the Great Depression and World War II. From 1904 to 1926, the steady flow of immigrants brought Yiddish language and culture to Montreal for the first time, to a public that was ready to consume them. Thus, within a few years, there was a bookstore (1902), a Yiddish theatre company (1912), part-time schools (1911), and a library (1914) operating mainly in Yiddish, which benefited the Eastern European newcomers. In 1907, a Yiddish newspaper was founded in Montreal by Hirsch Wolofsky, called Der Keneder Odler (Canadian Eagle), and it became an overnight success. This was the beginning of Montreal’s Yiddish literary production, which would flourish during the interwar period. During this same period, powerful unions from the textile industry were on strike, supporting the workers who produced men’s and women’s clothing. At one point in 1912, 5,000 workers participated in a general strike. Synagogues, charitable organizations, soup kitchens, and political movements were emerging in and around the port. A very strong community network was established during the interwar period. It offered services to all types of people of Jewish origin. The services included a hospital in 1934, public health clinics, organizations to help immigrants, and full-time schools that prepared the next generation for the workforce. The 1960s was a turning point for the Jewish community because the majority of Montreal Jews were now native Canadians and the population had reached 102,000. However, the most notable progress by the Jewish people came from the economic side of things. The gradual fading of religious segregation, language barriers and cultural uniformity opened the gates to accelerated professional mobility, which led to greater overall prosperity following the end of the war in 1945. Montreal experienced an exceptional period of growth that would benefit all the cultural and religious minorities already in the city, as well as those that arrived in the 1950s and 1960s. Almost a half a century after the great migration, the Jewish people, who had focused a lot of their efforts on quality education, started to see doors open at universities and among the most lucrative liberal professions. Entrepreneurs who had entered the fields of retail and marketing benefited from the upturn in the economy. Property values soared, people were consuming more, and demands in the housing market were steadily increasing. This was the period when the great Jewish fortunes – such as the Bronfmans, the Steinbergs, and the Cummings families – emerged in Quebec and Canada. Many lesser-known families established their empires in real estate, large-scale trade, and industries such as food products and distilled beverages. For the first time, starting in the 1960s, the Montreal Jewish population was becoming bilingual and taking on the local identity. This was spurred by the major identity changes that resulted from the Quiet Revolution, which had opened the minds of the French-speaking population to Montreal’s religious and cultural diversity. Language laws, such as the Charter of the French Language in 1977, progress in human rights, and the development of the Quebec state gave the Jewish community greater access to public funds from the provincial treasury. The arrival of a significant wave of French-speaking Sephardic Jews from Morocco also helped bring the Montreal Jewish community closer to its neighbours. From this point onward, the Jewish people began to leave their mark on Quebec society in fields as diverse as politics, music, literature and theatre. Jews contributed to all university, scientific and legal fields. Some community members took on top-notch careers that touched on all aspects of knowledge and social engagement, while others became contractors and built shopping centres and new residential neighbourhoods, or entrepreneurs who influenced fashion. The francophone population was now also discovering Jewish cuisine because they were shopping in Steinberg grocery stores and frequenting Saint Lawrence Boulevard. Victor Goldbloom became Minister and led the construction of the Olympic installations; Judge Alan B. Gold negotiated with the Mohawk people during the Oka Crisis; and Leonard Cohen took the world by wonder with his music. The ethnic barriers that had once divided Quebec fell and beneficial mutual exchanges took place between citizens of different backgrounds. This site presents the journey of 100 Jewish figures who have, in one way or another, contributed to Quebec society, whether it was though professional dedication, artistic creativity, or social engagement. Some are already famous and others deserve more recognition, either for the quality of their contribution, or for its uniqueness. Inspired by their Jewish upbringing and their willingness to participate in improving conditions for all citizens, all of them have left an indelible mark on their community. Juifs d’Ici™ is a trademark of Federation CJA. We apologize for any inadvertent errors or omissions.